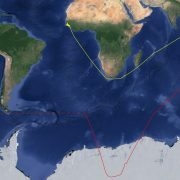 The red tracks show the broadcast position of the Lu Yan Yuan Yu 10 apparently transiting across Antarctica (inset). The yellow tracks show its true location along the coast of South America passing through the Strait of Magellan and into port at Lima, Peru. It has been almost 15 years since we first launched SkyTruth with the belief that sharing images of habitat loss and environmental change would not only contribute to public awareness of the human footprint on our earth, but would become a valuable resource for scientific research and discussion. As a scientist who comes from a family of scientists, SkyTruth President John Amos is driven by a deep-rooted interest in seeking evidence-based truth. Whether that evidence unveils nefarious behavior by commercial interests and colluding government entities, or debunks myths of over-eager watchdogs crying wolf, our job is to put it out there for public scrutiny. So, it is immensely gratifying when our work is used to advance scientific knowledge of the health and environmental ramifications of human activity. Our data and analysis has contributed to a variety of studies and been cited in numerous research papers on issues ranging from mountaintop removal (MTR) mining, offshore oil spills, the effects of fracking and commercial fisheries. 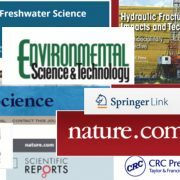 Here’s a sampling of some of the scientific and academic publications to which our work has contributed. Through the Global Fishing Watch Research program, our analysts work directly with world renowned experts and academic researchers, applying our data to some of the most pressing issues facing global fishing and ocean sustainability. Among the first fruits of those partnerships is the article “Ending Hide and Seek in the Oceans” published in Science magazine in April, 2016. Co-authored by Doug McCauley of University of California, Santa Barbara, our chief technology officer, Paul Woods, our data analyst Bjorn Bergman and other collaborators. Two months later, that article was cited in a paper published in PLoS ONE titled “Improving Fishing Pattern Detection from Satellite AIS Using Data Mining and Machine Learning.” Authored by our research partners from Dalhousie University in Nova Scotia, Kristina Boerder, Boris Worm and colleagues, the paper outlines work that is directly contributing to and being built up by our Global Fishing Watch computer models. Having been responsible for revealing the extent of the BP Deepwater Horizon oil spill in 2010, SkyTruth’s analysis of the volume of the slick and the daily rate of flow has made its way into the general scientific literature on analysis of the spill and its impacts. Our direct contributions to the literature includes an article co-authored by SkyTruth president John Amos along with Elliot Norse, president of Marine Conservation Biology International. Titled “Impacts, Perception, and Policy Implications of the BP/Deepwater Horizon Oil and Gas Disaster,” the article was published in the November 2010 issue of Environmental Law Reporter’s News & Analysis. That article was later adapted into the article “Deepwater Horizon Revisited” and published in Earth Imaging Journal. A paper in the January 2013 issue of the journal Sustainable Engineering authored by researcher Konstantin A. Korotenko of the Russian Academy of Sciences P.P.Shirshov Institute of Oceanology and his colleagues. The paper titled “Modeling 3-D Transport and Dispersal of Oil Plume Released During BP/Horizon Accident in the Gulf of Mexico in 2010” included a cumulative slick footprint of the spill created by overlaying all of the oil slicks mapped by SkyTruth on satellite images taken between April 25 and July 16, 2010. Shortly after the BP disaster, in April of 2011, we led the formation of The Gulf Monitoring Consortium, an alliance of non-profits that collects, analyzes and publishes images and other information to investigate and expose pollution incidents that occur in the Gulf of Mexico and Gulf Coast region. We released a summary of our findings over the first six months, Report on Activities from April 2011 to October 2011, that documented under reporting and lack of reporting of oil spill by responsible parties and inconsistencies in collection and publication of oil spill reports by National Response Center. In August 2013, we issued another report titled Lessons from Hurricane Isaac: Gulf Coast Coal and Petrochemical Facilities still not Storm Ready. Independent academics have used SkyTruth’s mountaintop removal (MTR) dataset to produce groundbreaking studies that have fundamentally changed the debate about the societal costs and benefits of MTR. We are especially gratified by the contribution our work has made in this arena. Among work by outside researchers, two studies in particular were cited by the Environmental Protection Agency (EPA) in their decision to overturn a permit that had been issued by the Army Corps of Engineers to expand the Spruce #1 mine in Logan County, WV. It is only the second time in EPA’s history that they have exercised this authority under the Clean Water Act. “How Many Mountains Can We Mine?” published in the journal Environmental Science and Technology. The research by Dr. Emily Bernhardt, a biologist at Duke University in Durham, North Carolina, provided the first conclusive evidence of a direct link between mountaintop removal mining to downstream water pollution and related environmental destruction. “The association between mountaintop mining and birth defects among live births in central Appalachia, 1996–2003” in the journal Environmental Science. Authors Melissa Ahern a health economist at Washington State University, Michael Hendryx an epidemiologist at West Virginia University, and their colleagues, found significantly higher birth defects in communities near MTR operations. Researchers at EPA, USGS, WVU and SkyTruth authored a study published in BioOne titled “The Overlooked Terrestrial Impacts of Mountaintop Mining,” which calculated cumulative loss of topographic complexity, forests, soil, carbon sequestration capacity, biodiversity, and human health due to MTR. Nicholas Zegre and Andrew Miller at West Virginia University authored a paper aggregating existing knowledge on the hydrological implications of MTR mining and highlighting areas for future. The paper, titled “Mountaintop Removal Mining and Catchment Hydrology,” was published in the journal Water. Researchers Nathaniel “Than” Hitt and Douglas Chambers from USGS conducted a study to determine the impact of MTR mining on fish populations and biodiversity downstream from mining sites at select watersheds in southern West Virginia. Their paper, “Temporal changes in taxonomic and functional diversity of fish assemblages downstream from mountaintop mining” was published in the journal Freshwater Science. Hydraulic Fracturing Impacts and Technology published June 2015. Authored by Venki Uddameri, Professor and director of water resources Center at Texas Tech University and colleagues. Wastewater and Shale Formation Development: Risks, Mitigation, and Regulation published June 24, 2015. Authored by Sheila Olmstead, associate professor of public affairs at the University of Texas at Austin. In January 2016, our work on fracking and mountaintop removal was referenced multiple times in a chapter of the book Risk Analysis of Natural Hazards: Interdisciplinary Challenges and Integrated Solutions. Published by Springer, the book is the 19th volume in the series Risk, Governance and Society, begun in 1986 titled.